Let's make 2018 a year to remember - and what better way to gain retention of your Company branding that a Promotional Letts Diary for that wholesome 365 day a year exposure - whilst offering your customers the many benefits that a diary can offer. Never miss a schedule, a meeting with a client or your family and friends phone numbers with these fantastic company freebies. 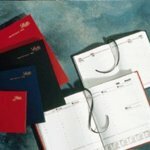 Contact us for a Promotional Letts Diary price or sample on 01989 565 281. Quarto size or A4, desk or pocket, a leather Letts diary with your business details and logo embossed in gold letters on the front, making this a classy Christmas business gift. So make your customers happy this new year and give them a Letts Diary to show you care and be advertised at the same time. We are independant agents and can therefore supply any Letts Diary in the UK. For a list of our promotional gifts besides our 2018 Letts Diary click here.